Well, it is spring break this week and it has been raining for most of it; which it is not supposed to do in Silicon Valley this time of year. So there were some kids hanging out in the office this week, since coming to work with Dad sounds fun after a few days in the rain. 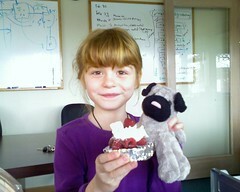 One of our favorite kids has discovered that SATURA CAKES is one of her favorite shops in downtown Los Altos. 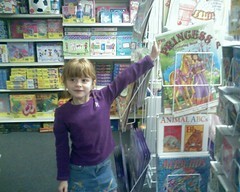 She also got a chance to visit Adventure Toys. There is nothing like finding a nice local store with tons of unique books and toys when you are at work with Dad. Back to the folks at Satura Cakes; these guys are master marketers. As we watched them open, we all had our doubts about how this business was going to make it. Well they are doing very well. There are not a lot of bakeries with the average ticket they are seeing or the traffic they are building including selling coffee at a pretty good clip when there is a Starbucks and Pete's coffee within a 100 yards. They do it with great local marketing. MerchantCircle is all about helping small merchants execute great local marketing so you to can do well when even there is a Starbucks, Home Depot, or even worse Walmart close by. Try our stuff, it is about to get a lot better in the next few weeks and we will help bring the Local Internet and the customers who are on the Local Internet to you....nothing like people in your local community seeing your business 3000 times in a few days...that drives traffic. Why Do Advertisers Hate the Yellow Pages?